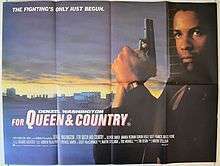 For Queen and Country is a 1988 British-American crime drama film co-written and directed by Martin Stellman and starring Denzel Washington. Washington stars as Reuben James, a Black British former paratrooper, who joined the British Army to escape the poverty of inner city London; Reuben fights in the Falklands/Malvinas War, and upon returning home he finds that society ignores and challenges him while trying to adjust to normal life. The film received mixed reviews and was a box office flop. It has recently been reevaluated as a serious critique of Thatcherism and its effect in the 1980s UK. Reuben James (Washington), although having grown up in London, was born in St. Lucia, West Indies, and joined the British Army to escape the poverty of inner city life. He serves with the Parachute Regiment, doing a tour in Northern Ireland for three years at the height of The Troubles in the late 1970s, and later fighting in the 1982 Falklands (a.k.a. Malvinas) in the South Atlantic for the remainder of his military career, eventually becoming a war hero himself. Six years later, after leaving the army, Reuben returns to civilian life in London. Much to his chagrin, he receives far from a hero's welcome, mostly no-one caring about his time in the army. Many of Reuben's childhood friends have turned to crime and drug-dealing to support themselves. He is shocked to find that his old community, the East End, is still beset by the crime, poverty and racism that made him leave rather than being a better neighbourhood. In particular, he suffers abuse and brutality at the hands of racist police officers, and he is soon pressured by some old friends to go against the law. He struggles to adjust to everyday life, but with increasing difficulty, losing his girlfriend (Amanda Redman). With changes in the British nationality law that occurred in 1981, Reuben also can't claim British citizenship and any residency of the United Kingdom at all. Reuben finds himself unemployed in the middle of the emerging recession in the country and is frustrated by being unable to find work despite his outstanding military service as a dutiful soldier. He begins to feel betrayed by the country he fought for. He drives a taxi for a short time, but is soon brought into business with Colin, a drug kingpin and former friend of Reuben (Bruce Payne), who was always nice to him. He becomes a vigilante bent on change instead of becoming a criminal himself. Reuben acquires a St. Lucia passport and gets two tickets to return to St. Lucia since he won't be able to go to Paris as he had planned to with his former girlfriend who sees him only as a bloody product of an old era and left him because she couldn't stand men with guns and his best friend's wife left him to move to Ireland. Reuben's old army friend, Tony, also known as Fish (Dorian Healy) - who saved Reuben's life in the Falklands and lost his leg there - gets Lynford down after the latter threatened to kill Reuben for telling the police that he killed Harry. Nevertheless, Tony/Fish is shot by a corrupt and racist policeman, Challoner (Craig Fairbrass) who started the harassment of Reuben in the first place. Reuben sets about avenging his friends' deaths and is able to during a riot between the police and drug addicts, shooting the policeman who killed his best friend. Reuben is targeted by a police sniper, who is also another friend from the army. Just as he fires the shot, the film ends. Stephen Lawrence, the teenager whose murder led to a massive reform of the Metropolitan Police Service, starred as an extra in this film. The film opened in 33 theaters in North America, grossing $62,771 during the opening weekend. It went on to gross a total $191,051. It was released on DVD on June 1, 2004. Film aggregator site Rotten Tomatoes gave the film a 31% rating and an average rating of 5.5/10 based on thirteen reviews. Leonard Maltin described the film as a "striking, laced-in-acid contemporary thriller of life in Thatcherite Britain". 1 2 "For Queen and Country (1989)". British Film Institute. Retrieved 2016-08-21. 1 2 "For Queen and Country". Box Office Mojo. Retrieved 2 February 2014. ↑ The Film journal, Volume 92, Issues 1-6. Pubsun Corp. 1989. Retrieved 6 November 2011. ↑ Bingham, John (1 June 2012). "Stephen Lawrence profile: the ambitious teenager with a fun-loving streak". The Daily Telegraph. Retrieved 22 November 2015. ↑ "For Queen and Country (1988)". Rotten Tomatoes. Retrieved 2 February 2013. ↑ Maltin, Leonard (2002). Leonard Maltin's film and video guide. Plume. Retrieved 4 November 2011.